Brother John Joseph “Black Jack” Pershing was born before the civil war and graduated from West Point in 1886. He became a Brigadier General in 1906, a Major General in 1916, General in 1917, and General of the Armies on September 3, 1919. As General of the Armies he was entitled to wear six stars. 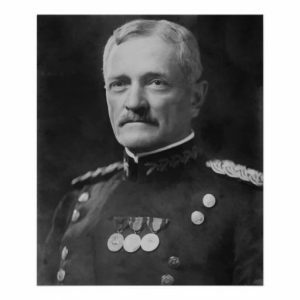 Pershing is the only person, while still alive, to rise to the highest rank ever held in the United States Army—General of the Armies—equivalent only to the posthumous rank of brother George Washington. On 11 October 1976, by Act of Congress, Washington was posthumously appointed to the rank of General of the Armies. The appointment was backdated to July 4, 1776 and was not considered a promotion to six-star general, but rather a symbolic promotion that made Washington the most-senior United States military officer. By executive order of another Masonic brother, President Gerald Ford, it was also determined that George Washington would always remain senior and could never be outranked by any other officer of the U.S. military. General Pershing retired from the military in 1924. 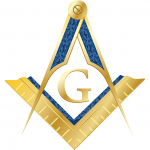 Pershing’s Masonic affiliation was as a member of Lincoln Lodge No.19, Lincoln, Nebraska. He became a Master Mason in Lincoln Lodge on December 22, 1888. He was made an Honorary Member of the Grand Lodge of Missouri on September 30, 1941 and in 1919 he was made an Honorary Member of Stansbury Lodge No. 24, Washington, D.C.
My grandfather, Winfield Mott, joined Holly Lodge #134 F. & A.M. after serving with Pershing in Texas, when his enlistment was up. He took his EA degree 10-3-1917, FC degree 10-19-1917, and MM degree 3-1-1918. Winfield told us that he was an aide to General Pershing, a notion that puzzled me since a general’s aide is usually a Major and above. It turns out that Pershing had affection for his horse and asked sergeant Mott to take care of his him. Win was in both Troup H of the 15th and Troup K of the 17th and had been involved in the formation of a new 16th cavalry in 1916. 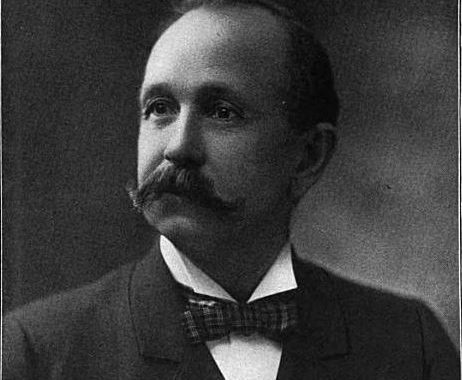 He was with Pershing during the Punitive Expedition against Pancho Villa when word came that Pershing’s family had perished in a fire at the Presidio in San Francisco. Only, his son, Warren, survived the fire. The 15th cavalry was reassigned from Ft. Bliss to the Philippines in 1915, and General MacArthur, in the Philippines at the time, arranged a baseball game between the 15th and men from the U.S.S. Manadnock. Grandpa pitched the winning game and shook hands with MacArthur receiving his congratulations. In 1946 while visiting my aunt at Walter Reed Army Hospital in Washington D.C. Winfield learned that Pershing was a patient there too but could not see him, as Pershing was too frail. General Pershing died 15 July 1948 at Walter Reed and was buried in Arlington National Cemetery. It is noteworthy to mention Peshing’s surviving son, Warren, who served in the Second World War as an advisor to Army Chief of Staff George C. Marshall and ended the war as a full Colonel. He was father to two sons, Richard W. Pershing and John Warren Pershing III. Richard Pershing served as a 2nd Lieutenant in the 502nd infantry and was killed in action on 17 February 1968 in Vietnam. John Pershing III served as a special assistant to former Army Chief of Staff General Gordon R. Sullivan, and helped shape Army and Army ROTC programs nationwide. He died 23 June 1999 thus ending the direct descendants of General John Joseph Pershing. By Bruce R. Black, member, Big Bear Lodge 617 and Daylight Lodge #232, Seattle, Washington.